Ensure the best possible finished product! BMW engines like the M42 are very stout units. When assembling these engines, the proper tools and machining make all the difference... Proper tolerances and assembly are crucial to the success and longevity of the BMW inline 4; whether it be a stock rebuild, turbocharged engine, or full race engine. 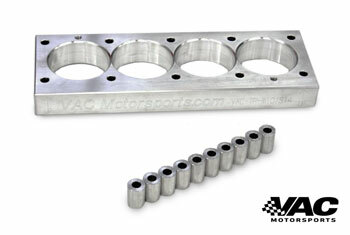 The VAC Engine Block Torque Plate 'loads' the block as if the cylinder head was already fitted. This torque applied to the block simulates the final assembled product and ensures that the cylinder walls are bored and honed perfectly round when final assembly is complete. Please choose Purchase or Rent from the menu above. Both choices will charge $324.95+ Shipping, however with rent option, you can then return the undamaged plate for a $225 credit. You only pay $100 Rental fee.